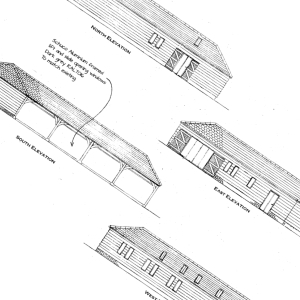 Test Valley Borough Council: Pure Town Planning are delighted to announce that they have recently secured consent for the conversion of former stables to create additional living space to a dwelling at West Tytherley in Hampshire. The necessary alterations approved included infilling the open front of the stable building with full height and width sliding glazing. The building is a former agricultural barn which historically was converted into a workshop/office until a successful Prior Approval application (secured by Pure Town Planning back in 2014) permitted the change of use of the building to a dwelling house. The client came to us with the intention to maximise their internal living space, thereby creating a more useable open-plan living area, by incorporating the adjoining stables into their living accommodation. As the site lies within the open countryside, Pure Town Planning devised a comprehensive Design, Access and Planning Statement to justify that the proposal would safeguard the landscape character of the area and have minimal impact upon biodiversity. So if you would like to maximise the internal living space of your dwelling, why not call Pure Town Planning on 01202 585524 or email info@puretownplanning.couk for a FREE 30 minute consultation on how we can get you that all important planning permission.